The score as heard in the film was, for the most part, butchered. Almost none of the cues are heard in their entirety, and some were dropped altogether. Although an original soundtrack CD was issued on the Southern Cross label, it contained only about thirty minutes of the score. This new Tribute recording doubles that amount, and presents the complete versions of all the music heard in the film, plus several unused cues, all in exceptionally well-recorded, thrillingly detailed sound. For those who have only heard the old CD, and especially those who have only seen the severely edited movie, this new recording will be a revelation. Astute listeners will notice that Herrmann revisited a few of his earlier works, reworking a few cues from previous scores, most notably On Dangerous Ground (including the famous Death Hunt, which receives a riveting, adrenaline-filled performance here). It’s official!!! 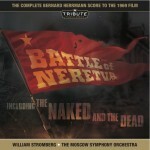 Tribute Film Classics presents their new recording of Bernard Herrmann’s BATTLE OF NERETVA and THE NAKED AND THE DEAD. Available at Screen Archives on December 28th! This score that John Morgan, Anna Bonn, and I did back in 1999 is now available for download only at itunes and CD Baby. The score is quite dark and somewhat influenced by Goldsmith, Goldenthal, and Herrmann. It’s fully orchestral and performed by the Russian National Symphony Orchestra. This end-of-the-millennium drama deals with the breakdown of communication, the loss of identity and the facelessness of corporate life. Phil and Anna are a young married, New York couple whose belief in their commitment to each other is on extremely tenuous ground. Each suspects the other of infidelity and even for this very modern thinking couple, this represents the worst kind of threat. But even as they feel each other slipping away, they are willing to do anything to save their relationship. Set in a highly stylized world in which no visual image, or character is random, Phil and Anna’s fractured world can’t help but implode. Back to regular programming of Rants, Raves, and Lists. I hope you all like this score. William Stromberg’s score for the independent horror film ARMY OF THE DEAD is available as a download only at itunes. Check out the samples at the ITunes site. It’s a score he wrote for a filmmaker friend Joseph Conti a couple of years ago, but is quite proud of some of the music and wanted to share it with you all. In the spirit of “Army of Darkness” comes this incredible chiller following a college professor as he leads his students on an archeological expedition in Baja, Mexico. After unexpectedly unleashing an ancient curse, they find themselves battling hordes of skeletal warriors who were once associates of Francisco Vasquez de Coronado. Jon Burlingame is the nation’s leading writer on the subject of music for films and television. He writes regularly for Daily Variety and the Los Angeles Times, and has written for such other publications as The New York Times, Washington Post, New York Daily News, Newsday, Premiere, Emmy and The Hollywood Reporter. He has chosen THE PRINCE AND THE PAUPER as one of the best of 2009. Click the link to read the full article and see his other choices.